Talion is back in a continuing adventure in the land of Mordor. Following the events of Shadow of Mordor, Monolith Productions and Warner Brothers brings us Shadow of War. 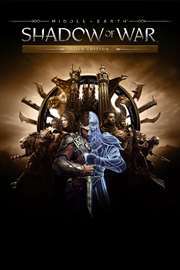 Does Shadow of war rule middle earth or should it have been burned and destroyed along with the rings? Let us find out. Story: The story picks up right from the events of Shadow of Mordor you are back playing as Talion and Celebrimbor. In the very beginning of the game, we see them making a new ring to fight against Sauron and the Azgul. There is a war happening in middle earth in this installment of the series between the Orcs, Uruks and Olacs and the Minas Ithil. You take sides with Minas Ithil to help them win the war; however, down the line you find out there is a traitor in the Minas Ithil. In the story, we run in to new characters that have an effect in the story like Shelob, a woman who can turn in to a big spider, which is cool in my opinion. She takes Celebrimbor as a hostage in exchange for the ring you created, so that she can take on Sauron herself. As the story continues, it became more confusing because there was so much going on with all the different characters and became less interesting as I progressed through it. There are four different acts throughout the story the second being by far the longest. Game play: The game play in Shadow of War is pretty much the same as the first one but with more RPG elements. However, it adds a few things as well; we still have the fighting style that we have seen in the Batman series. One thing I really enjoyed and found very annoying at the same time was the fortress raids. In order to progress through some of the story you need to take over these fortresses to clear the region. While doing some of these missions you feel like your weapons are never strong enough to defeat all the captains at one check point, but luckily I was able to beat this game without using the micro transactions. Throughout the game, you will brawl, use stealth, manipulate and climb your way through Mordor. Another feature I found in this game that was a bit tedious was building your own army. How you do this is by recruiting captains after you weaken them and they help you when it is time to do a fortress raid and take on the overlord of the fortress. This is not mandatory but it helps when it comes to difficulty but I just found it tedious. Game play design is not great in this case and unfortunately is one of my biggest pet peeves when it comes to games. When you clear a camp, it should remain cleared and not have the enemies re-spawn. As you progress through the story you will run in to a fair bit of collectibles like artifacts and memories which are words that go to a poem that unlocks a door and behind that door is a high level armor or weapon. Conclusion: Shadow of War is a fun game but by the time, I hit the Twelve-hour mark I felt it became very lack luster, and I just wanted to be finished. It has lot of new additions to compare to the first one, but does not feel as polished. The story is far less interesting and has a lot going on with it between the characters and your character that is becomes hard to follow. With some game play flaws that are very noticeable it becomes very lack luster just a few hours in to the game I struggled just to finish it but the pay off at the end of the game was worth it.